I understand this is a download item only. Furniture sales in the US are $100 billion annually. This includes not only sales for home but also industry. Close to 200 schools nationally teach woodworking including many universities. There is a huge market for attractively designed furniture not only as a functional statement but also as an artistic expression. The beauty of wood and its versatility are prized by interior designers. This class will teach the student how to create custom designs and convert them into production-ready blueprints. TurboCAD Pro Platinum 2016 with professional 2D/3D CAD tools, ACIS solid modeling, and photorealistic rendering. Training Guides with single-session lessons to teach common 2D and 3D skills. 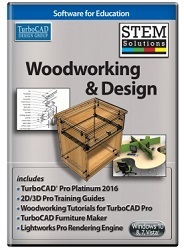 Woodworking Tutorial Bundle to teach specific topics such as the Roll Top Computer Desk, Workplanes, and Drawing Templates tutorials. Plug-ins that extend the power of TurboCAD Pro Platinum to design custom furniture, enhance lighting, and photorealistic renderings. Combines professional style with ergonomic design to suit all environments and viewing demands.